Today I went along with the novices to their Pirivena (monks’ school) to take some photos. It’s about a mile and a half through the jungle lanes and they walk back and forth each weekday. We took a tuk-tuk today. They leave the temple at 12:30 in order to get their by 1:00. Classes are over by 5:00 and they are generally back here before 5:30. This pirivena is situated at the edge of a temple that is quite a bit larger than ours. Novices come from surrounding temples to attend classes. 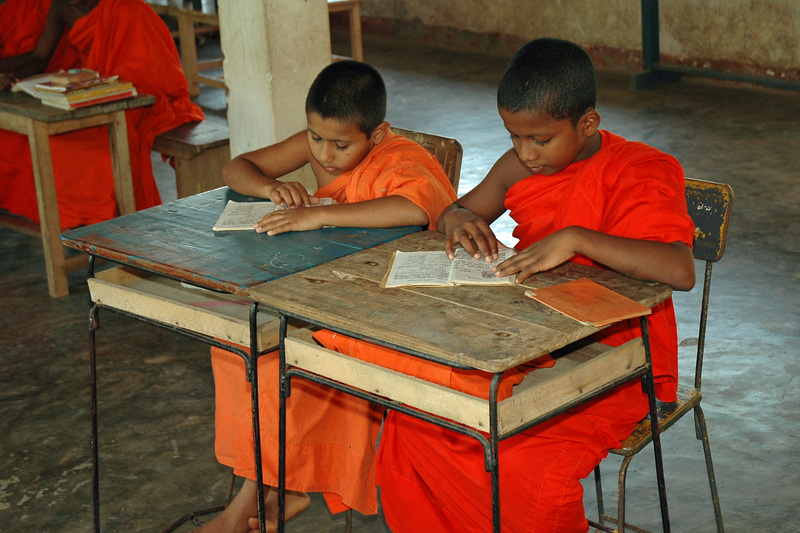 They are taught Sinhala grammar, English, math, Pali, Buddhist history and culture, and the study of the Suttas (Buddhist scriptures). Some of these boys come from very poor families and this is the only prospect they have for an education. Some will leave the sangha by the age of 18, some will run away if they find the life too difficult or they are treated harshly by older monks. Most will take higher ordination when they reach 21. Then again some may disrobe after 2 or 3 years if they find the 200 plus vows too difficult to live by each day. Monks (the correct term is bhikkhu) generally migrate into one or a mix of several life endeavors. A few will seek to reach spiritual enlightenment and devote themselves to near constant meditation, isolation in remote monasteries or even caves, and depravation of anything sensual , eating only the most basic food. These true ascetics are rare these days. I would venture that the majority would be western convert monks. Another group will become scholars not only of Buddhist history, culture, and philosophy but even more traditional academics. Many go on earn Doctorates in Philosophy, Literature, etc. and publish scholarly books. Some like Bhante Wimalaratana even become chancellors of universities. Teachers at all levels in the education system often come from this group. Others become business administrators, managing the affairs of large temples and community development centers. In this case, the Buddha’s proscription against monks handling money has to be waived. Senior monks from this and the previous group serve as advisors to government officials and serve on government committees. One radical group of monks here in Sri Lanka actually formed a political party and got members elected to parliament. Others may devote themselves to social service. In a city temple they will work in a community development center running vocational schools or support centers for the aged. In small, remote rural village temples they will try to muster support from local governments, NGOs and the villagers themselves to develop irrigation works, or flood control projects. They obviously serve as spiritual advisers but also in roles similar to marriage counselors, small claims court judges, and general peace makers. Sometimes, whether they were born in the big cities (Colombo, Galle, and Kandy) or the rural countryside will determine their path. And of course there are many combinations of these roles. 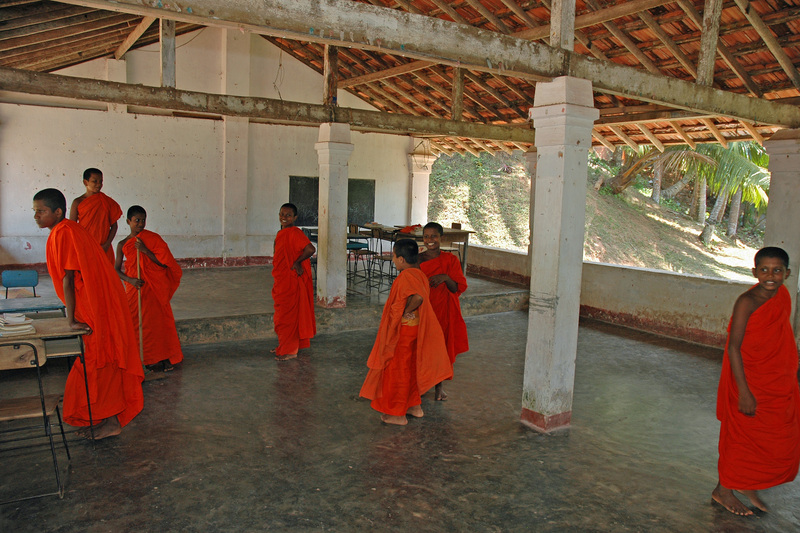 There are 3 major divisions amongst the sangha in Sri Lanka. Fortunately, the Buddhist teachings had been well established in Sri Lanka before it was practically destroyed in India. This southern tradition then made its way to Thailand, Laos, Cambodia and Burma. A northern tradition had also taken the route through Tibet to China, Japan and Korea before the Indian collapse. But after centuries of colonial rule by the Portuguese and Dutch, the sangha in Sri Lanka had fallen on hard times and the direct lineage of ordination back to the Buddha had been lost. In 1753, a delegation of reformers went to Thailand (Siam) to seek help in reestablishing the lineage. This was done and it subsequently became known as the Siam Nikaya. However, most of the monks came from the high caste Govigama families originating chiefly in the mountain capital of Kandy. They kept membership exclusive to their own caste for many decades. As a result another group from a lower caste went to Burma to reestablish their own line of ordination. And later another group from the then remote rural south formed another line. I often liken it to the many church groups within the Protestant religion although I’m not sure this is an appropriate analogy. Bhante Wimalaratana in Colombo and his older brother, Bhante Dhammaratana in Singapore are both senior leaders in the Siam Nikaya. Rev. Piyananda here in Godagama was also trained in this nikaya. I find it interesting that the monks who practice the strictest discipline are often western convert monks. Many of them served in the Peace Corp in Southeast Asia and stayed on for many years thereafter to study under such famous teachers as Ajahn Chah and Ajahn Buddhadasa in Thailand or similar famous teachers in Burma. A few of have stayed in the jungle but many more have gone on to establish monasteries and meditation centers in the U.S., Australia, Canada, the U.K. and Europe. I even correspond with a Ugandan monk who studied under the inspiring and often published Sri Lankan monk, Bhante Henepola Gunaratana, who now resides in West Virginia at his Bhavana Society forest meditation center. He is now establishing a meditation center near Kampala in Uganda. Many of these centers are supported by expatriate cultural Buddhist communities (Thai, Sri Lankan, Cambodian, etc). But the western monks are not that involved with the cultural necessities that would be expected of a native monk. So they have a certain freedom to pursue their ascetic practice. Anyway, that’s about all that I think I might know about these things. I’m concerned about Rev. Piyananda and where he might be headed. He has great responsibility for such a young monk (he just turned 25 last month). He’s very bright and he works hard to support and guide the village. He attracted Bhante Wimalaratana’s attention and subsequent support in the first day after the Tsunami. While delivering water and medical supplies in the area, Bhante observed Rev. Piyananda and his monks tearing their robes into bandages and turning the temple compound into a relief and grief counseling center. He is truly loved by the villagers. But because of Bhante Wimalaratana’s international associations, there had been a large number of foreign visitors after the Tsunami. Rev. Piyananda was exposed to people and a way of life unlike what he knew growing up. He now has urges to travel. He went to India for Buddhist pilgrimage in December. Most monks do at sometime. Bhante Dhammaratana invited him to Singapore so that some of the supporters there could meet him. He took the occasion to go on to Melaka, Malaysia for a few days. Last week he went to Colombo to get a Korean visa. And I think he is establishing a history of going abroad and then returning home in the hopes of getting a visa for the U.S. If he has a significant fault it is, I believe, that he is too tolerant. There are a lot of young men in the village who are unemployed or underemployed. They are very nice boys and are very helpful with all sorts of projects around the compound. But they tend to hang around the monks’ residence quite a bit of the day. I think Samanera Dassana (who I mentioned a few letters ago) attracts them as he is a bit of a loafer himself, at least as far as religious duties. It’s hard to fault the boys because life without a job is very boring in a rural village. I think perhaps Rev. Piyananda tolerates it is because the alternative is for them to be at one of the several houses that sell arrack and bootleg liquor. He does not tolerate this and sends them home if he thinks they’ve been drinking. So the sanghawasa looks and sounds like a social club sometimes. It is not a place for serious religious study or contemplation. But all religious duties and rituals are performed with great diligence. I’m afraid that he might eventually disrobe and that would be a real loss to the village. For those anxiously waiting to hear about the continuing saga of the ants, a few found their way into my electric water kettle and were unceremonious boiled to death as I had not looked in the pot that morning. I expect retribution any night now. As for the refrigerator being used to keep ants out of the food, forget it. I think they infiltrate by hiding on the bottom of the jam jar. It seemed as if yesterday was field day here. Everything was swept and mopped, the refrigerator was cleaned out, and the curtains were taken down, washed and laid on the ground to dry. The curtains in my room are a white, machine woven mesh, made to look like lace. At least they were white once upon a time. Somebody brought a clay pot of curd and a bottle of palm honey to our kitchen yesterday. This is a favorite treat of mine although no one else here seemed all that excited. It’s made from buffalo milk and has the smooth creamy texture of a good Greek yogurt. Asian Buffaloes don’t carry tuberculosis like cows do and as its not pasteurized, that’s a good thing. There was a funeral in the new village last week. So the family donated a few items to the temple that had belonged to the deceased. I looked out the computer lab door to see 2 boys and a monk carrying a chair up to my room. It looks quite old but is very well made. It has a stuffed plush back and seat. I look very grand setting in it in the evening while wearing my sarong. I’ve attached a few photos of the boys at school.